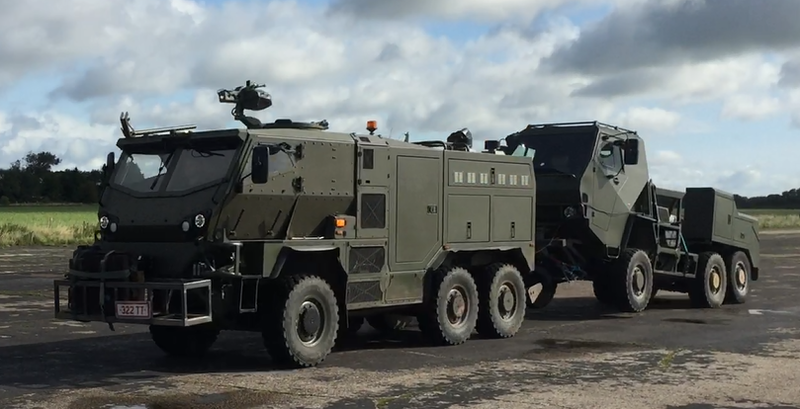 Developed for the UK MoD’s Light Weight (Air Portable) Recovery Capability, this all-new 6×6 Supacat variant is based on the acclaimed HMT 600 vehicle, most commonly known as Coyote. 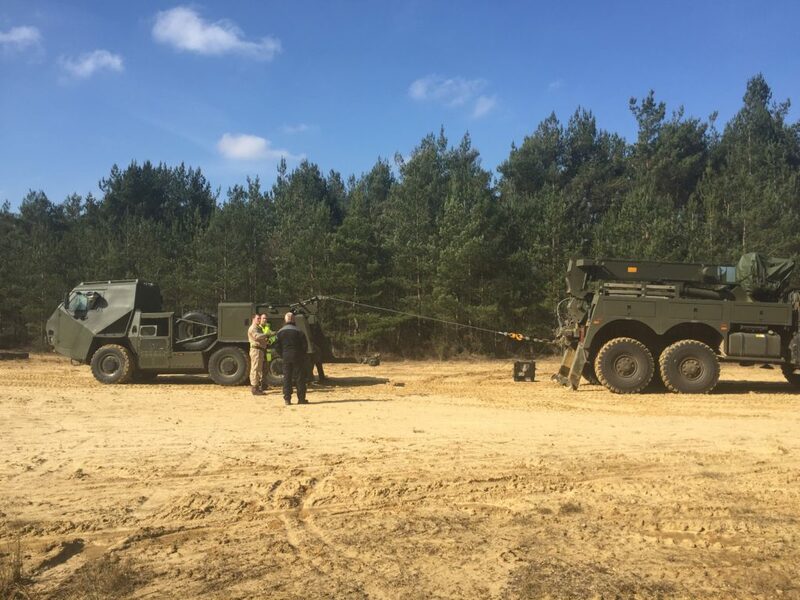 With mobility levels matching those delivered by the sister Jackal and Coyote fighting variants, this vehicle is designed to recover casualty vehicles from the most challenging urban and rural environments, whilst providing optimum levels of crew protection. 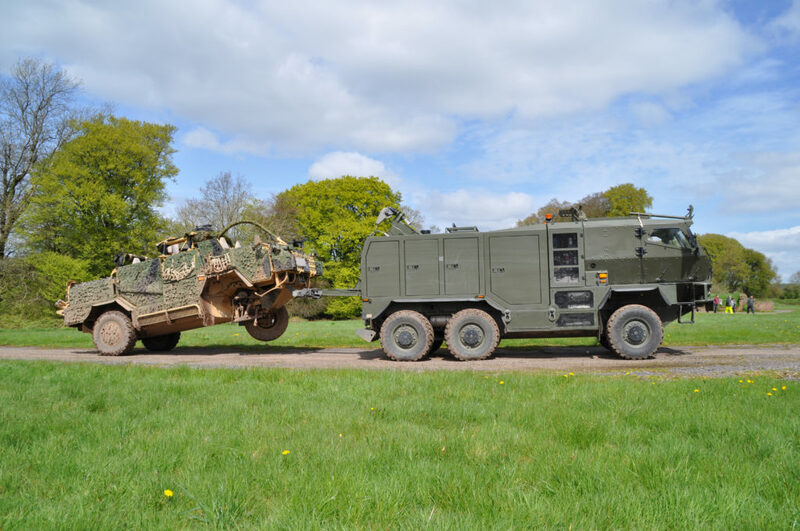 The HMT Recovery breaks new ground in terms of high mobility, light weight recovery capability and as such, is unmatched in tactically recovering casualty vehicles, within the specified size and weight envelope. The HMT Recovery is equipped with a specially designed Miller Industries, Boniface Century 2465 crane hamper and a Rotzler TR80 main winch as standard. At the touch of a button the operator can switch the recovery system from normal mode, with a maximum recovered vehicle axle mass of 3.8 tonnes, to an enhanced mode, capable of lifting up to 6.1 tonnes. As with all HMT platforms, the modular hamper design can be reconfigured to suit a customer’s specific requirements with regards to capability, layout and stowage. The vehicle is capable of wading through up to 1.5m of salt water, with an additional 0.5m of wave splash. This enables the vehicle to be deployed from landing craft. It can operate at -30 to +50 degrees. 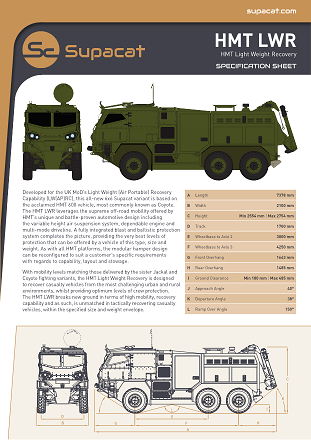 Designed by Supacat, the HMT product is manufactured under licence from Lockheed Martin.